Cute little notecards are always handy to have on hand for quick gifts, notes and tags and these ones are no exception!! 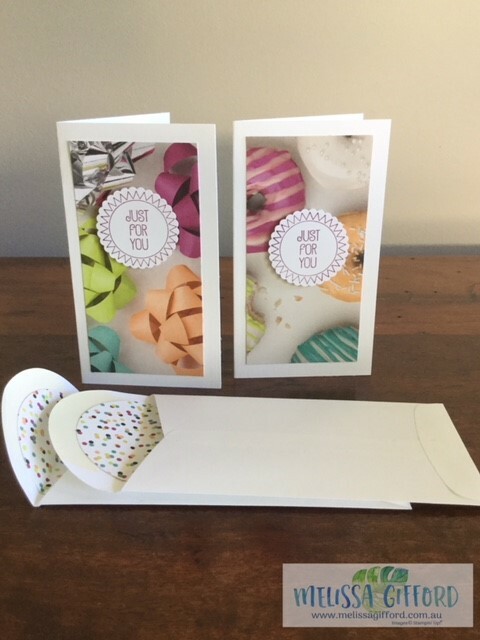 The Narrow notecards and envelopes are an economical way to give someone a little handmade card to show you care. The pack contains 20 cards and envelopes. These cards were made using the same paper as my last post - Picture Perfect Party. By cutting the 6 x 6" pieces into 2 x 4" you can get 4 pieces from one sheet. I then adhered the inside flap of the envelope with a a 2 1/4" circle of the same paper stack in a coordinating pattern. Add a little punched out sentiment and you are done! Stampin Up's CEO Sara Douglas made these cards using the cute Tutti Frutti set so I might try that next! Why not give them a try yourself? Click on any of the images below to head over to my online store. Remember to take advantage of Sale-a-Bration and claim you FREE gifts with a qualifying order!